Our new Canadian Flag is ready to hang and tomorrow we will celebrate Canada's 145th Birthday, joining fellow Canadians with celebrations all across Canada. here is a cake which includes how to stretch your cake mix to fit an 11 X 14 rectangular pan. Not only does this fill a pan properly, it gives the cake a moist crumb and homemade flavour. Prepare an 11 X 14 X 2 inch cake pan by lining two long sides and the bottom with parchment paper. Preheat oven to 325. F.
Combine all the dry ingredients into a large mixer bowl and wisk together. Add all the remaining ingredients and beat together on medium speed until smooth, about 2 minutes. Spread the batter evenly into the pan and bake for about 50 minutes or until a toothpick tests clean in the center. Allow the cake to cool on a wire rack for 30 minutes and then turn it out onto fresh parchment paper. Gently remove the parchment paper from the bottom and slice in half horizontally to make a two layer cake. This can be a bit tricky but don't worry if the top layer cracks a bit when you lift it...it will be covered by whipped cream at the end. Blend the dry ingredients together in a medium sized microwave safe bowl, or a medium saucepan. Add the milk and stir with a wisk and heat until almost boiling. Pour a little bit of hot milk into the egg yolks and stir to temper the yolks. Add a bit more milk until you have added a total of about a cup of milk. Pour the egg mixture back into the milk mixture and continue to heat until thickened and just beginning to simmer. Remove from heat and add vanilla and stir well. Pour the Custard Filling onto the bottom layer of the cake which has been placed on a large tray. Allow to set for 15 minutes before adding the top layer. Put the top layer of cake on the pudding layer and chill for 30 minutes. Beat 3 cups of heavy whipping cream together with 1/2 cup sugar and either 3 tablespoons instant vanilla pudding or 3 packets of Dr. Oetkers Whip it to stabilize the cream. It is important that something be added to stabilize the cream for decorating. Spread the whipped cream over the top and the sides. (about 1/4 inch thick). Put the remaining whipped cream into a pastry bag and decorate the edge and the swirl a bit onto each piece. I find it easier to cut the pieces first and then put the swirl of cream exactly in the middle. Decorate each piece with half a fresh ripe summer strawberry. Chill until serving. Makes 30 pieces. This is a good recipe to use left over chicken or any kind of left over roast. I usually add a few shrimp at the end just to bring variety to this dish. This recipe can easily be doubled. In a large skillet with a lid, put in a bit of oil, onion, pepper, oregano and saute until softened. Add the garlic, broth and tomato sauce, beans and bay leaf. Cover and simmer until rice is almost cooked, about 15 minutes. Add the cooked chicken and raw shrimp, cover and cook until the shrimp is pink. This recipe is simple and satisfying and will serve 6 people generously. Cook the spaghetti in salted boiling water, drain. Stir butter into hot spaghetti. Stir in Parmesan and beaten eggs. Form spaghetti mixture into a "crust" in a buttered 10 inch round baking dish. Saute the onion and green pepper in a tablespoon of Olive oil until soft and then add the hamburger to the mixture and cook till hamburger is browned. Stir in the tomatoes, tomato paste, sugar, oregano and garlic salt. Add salt to taste if desired. Spread cottage cheese over the spaghetti crust in the baking dish. Pour and spread the hamburger mixture over the cottage cheese. Bake uncovered in a 350 degree oven for 20 minutes. Sprinkle mozzarella cheese on top and bake an additional 5 minutes or till cheese melts. It can't get much simpler than this! This was originally my Aunt Kay's recipe; it was called 'apple squares' and was made with tart cooking apples. A crumb mixture is packed into a pan to form the base...with reserved crumbs sprinkled over the fruit. 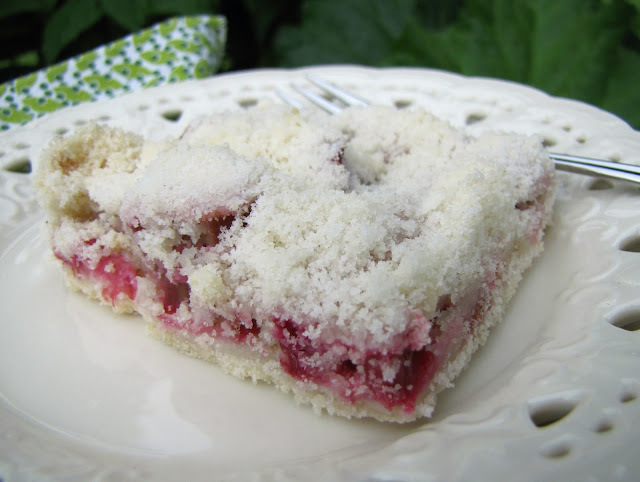 If you still have rhubarb in the garden, you might want to try these simple rhubarb squares. If not, wait for the early apples (coming soon) and whip up some apple crumb squares. Combine flour, sugar, salt and butter and mix to form uniform crumbs. Use slightly more than half the crumbs to form base, pressing into a greased 9" x 12" pan. Top with a layer of rhubarb. Sprinkle with sugar and nutmeg. Spread remaining crumbs evenly over rhubarb. Bake at 350°F for 30-40 minutes. *Substitute chopped or sliced cooking apples for the rhubarb and sprinkle with cinnamon instead of nutmeg. On a recent trip to Denmark we were served a lovely salad at a "Taste of Spring" buffet. It was beautifully garnished with tiny edible red flower petals. I've substituted the more available finely chopped red pepper. If you have edible flower petals available use them. I think it would be a lovely addition to a summer BBQ as you can prepare the vegetables ahead and assemble it at the last minute. Place shallots in a small bowl and sprinkle with 1 tablespoon balsamic vinegar and 1 tablespoon oil. Stir to coat and let sit for about 1/2 hour. This will remove that sharp raw taste from the shallots. Trim green beans and cut into 1 1/2" lengths. Blanch beans for one minute in boiling water and immediately plunge into ice water. Remove as soon as they are cool. Snap ends off asparagus spears and break into 1 1/2" pieces. Blanch asparagus as you did with the beans. Blot vegetables dry and set aside in a bowl. For Vinaigrette: Mix oil, vinegar, honey, lemon juice, lemon zest and seasonings in a blender or shaker. Add shallots to beans and asparagus in a bowl. Pour about 1/2 of the dressing over beans and asparagus and toss to coat. Let sit until serving time. Arrange salad greens on a large serving platter. Using a slotted spoon, arrange beans and asparagus on salad greens. Scatter with chopped red pepper. Finely chop 2 of the hard boiled eggs and arrange over salad. Cut remaining eggs into narrow wedges and garnish salad. Who wouldn't want to come to the table? Take advantage of all the fresh fruit available throughout this season. Fresh raspberries and sweet ripe peaches are a tasty pair and add nutritional value to a stack of pancakes. Make your raspberry sauce ahead of time and have your fruit cut up so that everything is ready when the pancakes come off the griddle. In a separate bowl beat egg slightly with a fork and add buttermilk and melted butter. Stir wet ingredients into dry ingredients and stir until well incorporated. Lightly spray griddle and heat. Using a 1/2 cup measuring helps to make pancakes uniform. Pour onto hot griddle until bubbly on top side, flip and cook several more minutes. Place frozen berries in a microwaveable bowl. Sprinkle with sugar and cornstarch. Cook for several minutes. Stir and cook one minute at a time until berries are cooked down and slightly thickened. Add lemon juice. Strain hot berry mixture through a fine sieve. Discard seeds. To Serve: Pour warm raspberry sauce over pancakes and top with fresh fruit. When I get quiet and sit down with God’s Word my responses to what I’ve read might start with lines from old hymns embedded in my memory and continue with truths I write back to God in bullet points. Here’s a recent response with passages that I searched for afterwards to confirm these bullet points. I don’t have to leave the tip! I can’t add anything to it. My hope for us all is that we never forget or water down the gospel and that we will be ready to share what Christ has done for us. Last summer, when Lovella and I were in Waterloo, we were guests at a pot luck hosted by the former president of Herald Press. It was delicious food, I must say. This is a recipe I asked for and now finally got around to making it. So, thank you, Joan. In medium sized pot, cover potatoes with water, add 1 tsp salt, bring to boil and simmer for about 10 minutes or until done. Drain water and let cool. Cut in half. Steam beans, making sure you don't overcook to keep color and rinse with cold water. I also boiled eggs to add. Cool eggs in ice water for ease of peeling. If you want a quick and easy dessert that is sure to please the taste buds, this dessert is for you. I received this recipe from a dear woman in our church, Lena Braun who just recently passed away well into her 90's. She loved to have people over and make them feel very special. In fact she had us over and made this dessert for us nearly thirty years ago, and we still have fond memories of her. I just loved trying new recipes and she gladly shared her recipe with me, that I gladly share with you. Take the serving cake plate you wish to use and place the ring of a 9" or 10" springform pan on the cake plate. Place 12-14 wafer cookies around the springform ring. Crush remaining wafers into crumbs and mix with 1/3 cup of melted butter or margarine. Make a crust on the cake plate. In a large microwave safe bowl put in the boiling water, instant coffee and marshmallows. Cool this mixture in the refrigerator for 1 hour stirring at least three times as it cools so the marshmallows and coffee don't separate. Whip the whipping cream until stiff. Fold into the marshmallow mixture. Pour into crust. This is best served after it has been refrigerated for at least 8 hours or over night. *For a gluten free option pour this filling into coffee mugs and serve as a mousse. 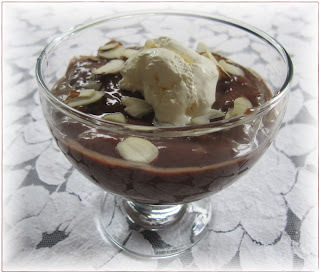 Chocolate Pudding fills the spot of my earliest dessert memory ! It has been a life-long comfort food even though my first memory of it involves something less than 'comfort' . I was about 3 or 4 years old and I was sitting in my spot at the kitchen table - the window behind me. Our home at the time was a little two room cottage without indoor plumbing or running water - I believe at that time we did not yet have electricity either. The wood stove Mom cooked on was also what kept our little house warm. Mom had made chocolate pudding for dessert that day and I could hardly wait to eat it! I remember Mom served it in soup bowls and handed me a generous helping. I enjoyed it and wished for more. Chocolate pudding has never been my Dad's favorite and I looked over to see that he was not finishing his serving. I asked if I could have it and with a twinkle in his eye he gladly passed over his bowl and I eagerly ate it. I still was not satisfied and asked Mom if there was any more. 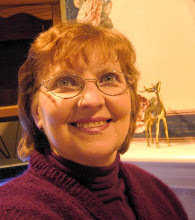 I remember Mom's face as she asked, "You want MORE?" but to my delight she got up and scraped the last of the pudding out of the pot into my bowl. I had almost finished it when I began to have a funny feeling ... the pudding wasn't sliding down quite so easily but I tried to ignore the unfamiliar sensation. I must have started to look a little green because suddenly Mom jumped up, grabbed the pudding pot and held it under my chin. Hmmm... how shall I say this delicately ? I'm sure you guessed it - the pot was once again filled with chocolate pudding ! That experience, however, did not spoil my love of the simple dessert ... though I never again ate three generous helpings! When I make it now it is a memory trigging taste taking me back to my childhood , something the packaged instant or cooked chocolate pudding just doesn't do for me! The flavour of the from scratch, home cooked pudding is just soo much better ! Cook, stirring continuously until it begins to bubble and the pudding thickens. Garnish, if desired, with toasted almonds and/or dab of whipped cream or ice-cream. PS. As noted by a commentor , this can be used as a pie filling. You may, however, want to add a little more cornstarch - maybe a couple of tsp more -- just to make the pudding a little stiffer. This is a casserole presentation of broccoli that is nice for a change and would work well as a side dish with a barbecued steak or chicken breast. In covered microwave safe dish cook broccoli with a little water for 5 minutes on high. Drain. Turn into 1-1/2 court oven safe casserole dish. Combine soup, mayonnaise, cheese, pimiento, and lemon juice. Pour evenly over broccoli. Top with cracker crumbs. Bake in 350 degree oven for 35 minutes. Makes 6-8 servings. 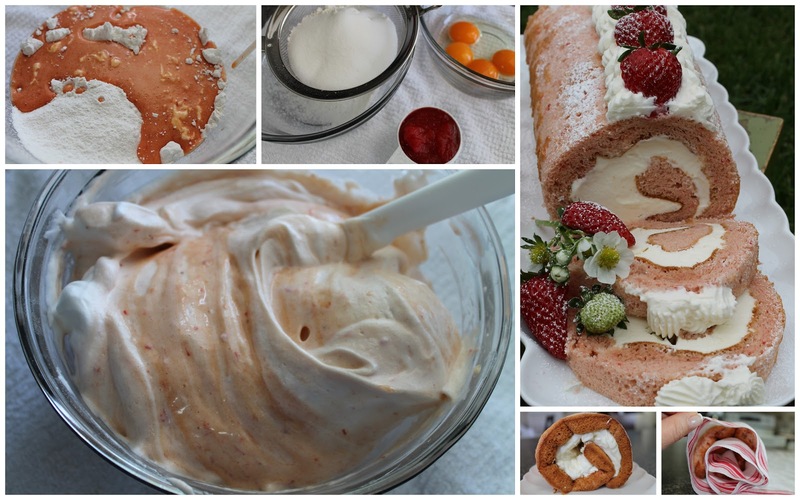 Strawberry season has arrived and though this dessert can be made all throughout the year using frozen concentrate...there is nothing like the garnish of fresh strawberries on the side or some juicy ripe berries tucked inside the chiffon roll. Line a 11 X 15 inch or 38.7 X 26.1 X 1.91 cm jelly roll pan with parchment paper with two sides hanging over edge. Wash a metal or glass bowl to be sure it is perfectly clean. Add the egg whites and cream of tartar. Beat egg whites and cream of tartar until frothy. Add the first part sugar and beat until stiff peaks form. Put the egg yolks and oil and strawberry concentrate in a medium bowl and wisk together. In a large bowl sift the flour, the second part of the sugar, the baking soda and salt together. Add the strawberry mixture and combine to make a smooth batter. Fold the egg whites gently into the strawberry batter until just combined. Spread into the prepared pan and bake for 15 minutes. While the strawberry chiffon roll is baking, barely dampen a clean teatowel with water and lay onto the counter. When the cake tests done with a toothpick, remove the cake and put the teatowel on top of the pan and flip them together onto the counter. Remove the pan and then roll the cake and the teatowel together from the short end. Place on a cooling rack until completely cooled. Whip the cream and sugar together until stiff. Unroll the strawberry roll, spread with whipped cream and roll back up. Gently sift confectioners/icing sugar over top and garnish with remaining whipped cream and strawberries. Chill until ready to serve or freeze the roll (without fresh strawberries) on a cookie sheet and then wrap in plastic wrap for up to a week. Slice while still partially frozen. *The fresh strawberries in the roll are best if the roll is served the same day and the roll is not frozen. If you want to make the roll a day ahead or freeze it...simply serve the strawberries on the side. These savory corn cakes are a great side dish on the menu. To add a bit more zip serve with sour cream, salsa, and extra herbs. 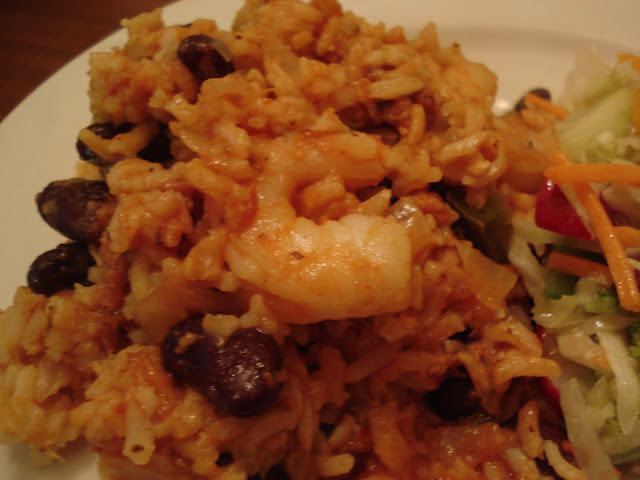 In a medium size bowl combine dry ingredients with shredded cheese and set aside. In another bowl whisk together corn, buttermilk, egg, and melted butter. Pour corn mixture over dry ingredients and stir just until moistened, like you would a muffin batter. Scoop batter for each cake on a hot grill (set at 350º) which has been lightly greased. They will spread a bit so no need to flatten them. Cook for 4 or 5 minutes on one side, until brown at the edges, flip, and cook another 4 minutes. Today we are celebrating Father's Day in North America. 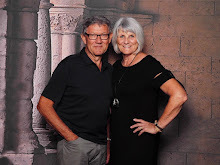 I am very blessed to have a father that gives his love to me generously and unselfishly, and doubly blessed to have a husband that always given of himself in every way he knows how for our children. For that I can never be thankful enough. By no means are these men perfect and with out their flaws, I too as a parent have many flaws and have disappointed and hurt the people that I love unintentionally. I know many of you have had hurtful experiences with their earthly father, however we have a heavenly father that is perfect, and His way is perfect even if we are unable to see it right now. I look at this picture of our youngest daughter holding tightly to her father's hand, going on a hike in the mountains. The path is unfamiliar to her, she is uncertain of what lies around the bend...Are there going to bears? Is the hike going to become more difficult with rough terrain along the way? Can she do it? She would have never ventured on that hike alone, but was fully confident that with her father beside her she could do it and her fears subsided. Is life not like that for us? We are uncertain of what lies around the bend on our path of life? God has set a path before us. A path of life all though uncertain, we can walk in hope, freedom and with purpose. We do not know what lies around the corner or what kind of rough terrain we will encounter. We need to be able to trust. I encourage you to take the hand of your heavenly Father, hold tight, and take a step of faith on the uncharted path that is set before you. with God by your side, you are never alone. This is a new family favorite recipe. Easy to prepare, taste great fresh or as left overs warmed up the next day. 5. Fry in skillet with enough oil so chicken fingers are not sitting on bottom of pan -- they actually absorb less oil if they float in it then if they sit in it. 6. Serve hot ! Delicious !!! I was using up a bit of this and that the other day and put together this quick little muffin with the two bananas, left over ricotta cheese and buttermilk that I had in the fridge. They are moist and have a tender crumb with just a touch of sweetness. Stir together all above ingredients in a mixing bowl. Add in the dry ingredients below. 3. Stir until just combined and spoon into 12 medium cupcake liners. 4. Bake in a preheated 350 F oven for 20 minutes. While the muffins are baking, warm a tablespoon of honey to make it runny and brush over the muffins as soon as you remove them from the oven. Return to the oven for a few minutes to glaze the muffins. Test with a toothpick to be sure they are baked through and the toothpick tests clean. While doing road trips in the USA, we like to stop at McD*'s for coffee on occasion. It's always a quick stop and the coffee is not bad. And every once in awhile we order their cinnamon melts to go with the coffee. Very tasty! I decided that I would attempt a copykat version in my own kitchen one day, to have with a good cup of home-brewed coffee. It was all good! So now I'm sharing the recipe with you. Stir together the water, potato flakes and sugar. Add eggs, softened butter, and yeast mixed with 3 cups flour. Beat with mixer on high speed. Stir in remaining flour, 1/2 cup at a time until a kneadable dough is obtained. Allow to rise until doubled in bulk (about 1 1/2 hours), before forming cinna-melts. Prepare cinnamon sauce by mixing the ingredients together. Set aside. Grease mini pie plates or over sized muffin pans. Roll out dough (1/2 at a time) to about 1/2" thick. Using a pizza cutter, cut 1/2" wide strips. Then slice these strips into chunks about 3/4" long. Drop 6 chunks into the bottom of each 'cup'. Spoon over about 1 tablespoon of cinnamon sauce over the dough. Top with another 7 chunks of dough. Drizzle over 1 1/2 tablespoons cinnamon sauce. Repeat for each cinna-melt cup. Cover and allow to rise in warm spot for 30-60 minutes. Bake at 350°F for 15-20 minutes...until golden. For icing, combine cream cheese and butter until smooth. Add powdered sugar, milk and vanilla. Beat until smooth. Spoon icing over warm cinnamelts. 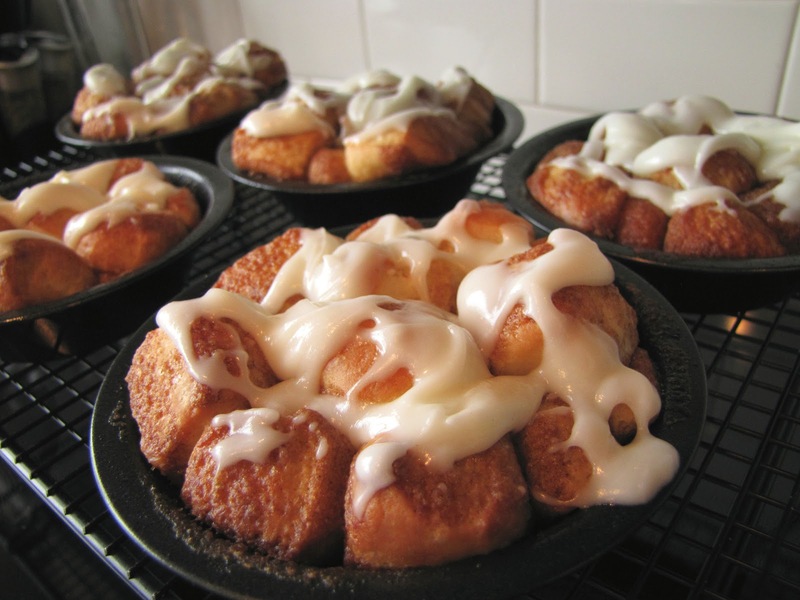 Double the icing recipe if you like more than a drizzle! * This is actually a refrigerator dough, so it is a simple thing to use only half and place the rest in a greased, covered bowl in the refrigerator for later use. It will be good for several days. Another favorite cookie recipe from my mom, made so many times for all of her grandchildren as they were growing up. Cream (room temperature) butter and shortening. Add in the sugars and syrup, beating until well combined, then the eggs and vanilla. Drop by Tbsp onto ungreased cookie sheets. Leave on cookie sheets to cool. Cook rice in the water following the directions for the rice you use. Saute onion in a bit of oil. Add the broccoli and chicken. Stir together the soup, mayo and curry powder. Put into a greased casserole dish. Cover with desired amount of cheese, I use old cheddar. Serve with crisp fresh salad. Serves 4-6. this recipe doubles or triples very well, and is great for potlucks. by Sarah Young titled "Jesus Calling". This past month the meditations have challenged me in how I view those daily problems, both large and small, that come my way. John 16:33 - "In this world, you will have problems." 2. Sarah Young suggests we begin each day anticipating problems and at the same time, asking God to equip us to face them. James 1:2 - "Count it all joy when you have many kinds of problems..."
When I expect problems, they will not blindside me. I can choose to look at problems as an opportunity to trust God. 3. The Bible challenges me to bring my troubles to God with a thankful heart. Philippians 4:6 "Be anxious for nothing but in everything by prayer and supplication, with thanksgiving, let your requests be made known to God;"
anticipate how God and I can face it together. Or He may ask me to put it aside for later consideration. Choosing thankfulness changes my perspective. 4. I can remember that God is thinking of me all the time . Psalm 130: 3 "You chart the path ahead of me, and tell me where to stop and rest. Every moment, you know where I am." some of which are problems, others which lift our spirits. God has a purpose in all that come my way. to focusing on God, our load becomes lighter. We can choose to trust Him - He does not abandon us - ever!. .....and call the kids for cookies and milk. Cream together butter, and both sugars. Add eggs, vanilla and water and beat well. In a large mixing bowl stir together all dry ingredients. Add dry ingredients to wet ingredients. Beat until everything is well combined. Drop mounds of cookie dough onto parchment lined baking sheets. Bake at 325º for 8-10 minutes. Edges should just start to turn brown. Do not over bake. Let rest on baking sheets for 1-2 minutes and then remove to cooling racks. This recipe is an old one I like to go back to again and again. I have usually made it using chopped dates. Peel orange, using potato peeler. Remove pith and discard. Divide orange into segments. Put thin peel, orange segments, sugar, eggs and oil into blender and blend until it resembles a smoothie. Add these wet ingredients to combined dry ingredients in bowl, stirring just until mixed. If batter is too thick, add 1/4 cup orange juice - it will depend on how juicy the orange is. Divide into 12 prepared, medium muffin cups. Bake at 400° F for 15 - 20 minutes. These cookie sandwiches are a nice dessert treat for hot summer days. I made them fairly large but you could use a teaspoon to drop the batter on the pans and you would end up with cute little cookie sandwiches. In a medium size bowl, beat butter and brown sugar until creamy. In another bowl, whisk together flour, baking powder, baking soda, salt, oats, and coconut. Add dry ingredients to the creamed mixture until combined. Drop by tablespoons on parchment lined pans. Flatten just slightly. Bake in a 350º oven for 10 to 12 minutes, until golden in color. These cookies will spread during baking and you will end up with approx 3" cookies. Once cookies are completely cooled, place a scoop of ice cream on a cookie, spreading it out with a knife, then place a second cookie on top. Press down slightly so the ice cream is flush with the cookies. 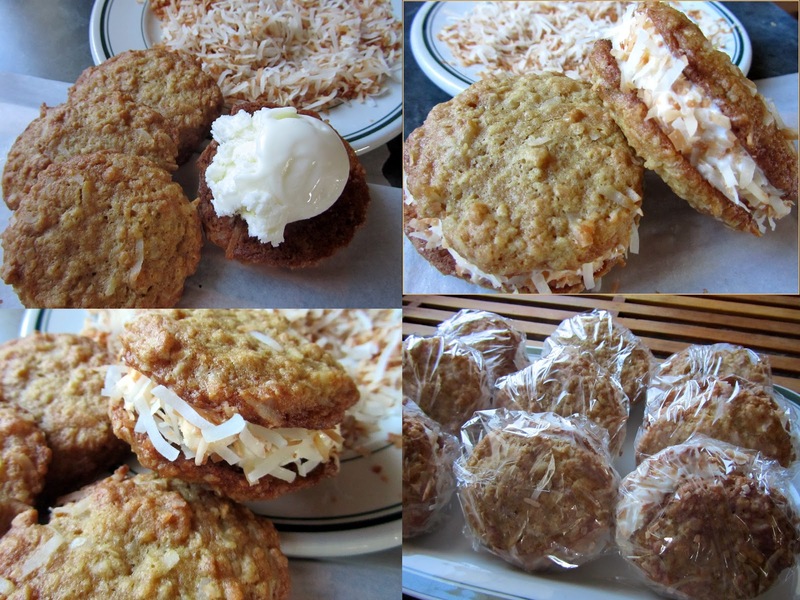 Roll the sides in toasted coconut. Wrap individually and freeze until firm. I was looking for something to make for supper that would appeal to their young, and sometimes fussy appetites. I remembered making these for their Daddy many years ago and pulled out the recipe to give them a try. Sure enough, they were as as much a success with today's children as for the previous generation. Brown ground beef with onion and pepper, drain any fat. Add basil and corn and remove from heat. Add just enough mushroom soup to moisten the meat and corn. Using an 8 cup measuring cup or bowl, melt butter in microwave. Blend in milk a little at a time, stirring with a whisk until smooth. Microwave for one minute at a time, stirring well each time. Cook until it comes to a boil and thickens. Stir in cheese until it melts and season to taste. Note: I always use my microwave to make sauces but feel free to do it on the stove if that's your usual method. Combine flour, baking powder and salt in a mixing bowl. Cut in shortening or margarine. Add milk and mix lightly with a fork until dough forms a ball. Roll out on a floured board to about 1/4 inch thickness. Using a circle or scalloped edge cutter, cut circles to fit into your muffin tin. I used a 4 inch cutter. Tuck into muffin tins so that the biscuit lines the bottom and up the sides of each cup. If you like, cut small shapes (heart, star) from leftover dough. Fill with cooled beef mixture and top with a cut out star or heart. Bake in a 450º oven for 12 minutes or until biscuit edges are lightly browned. 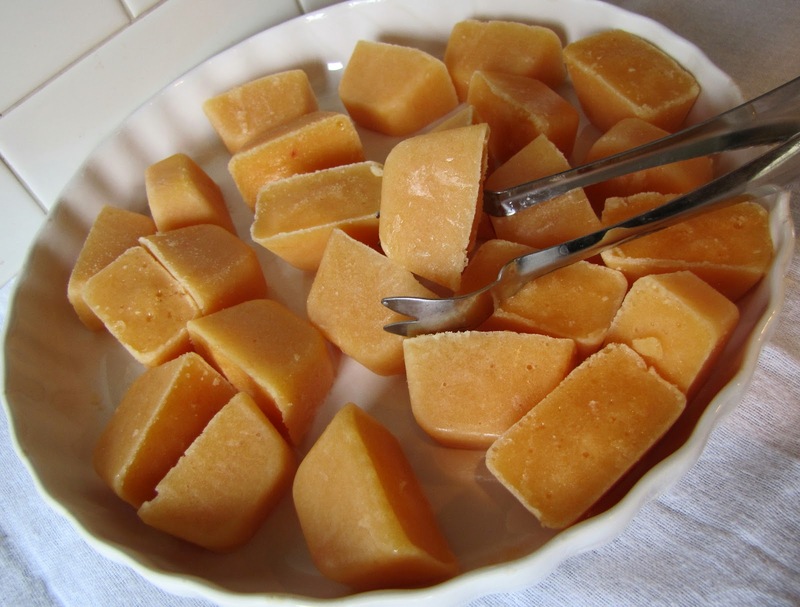 When I came across a photo of peach ice cubes recently, I knew that was something I would like. It seems others do as well...and have requested the recipe. So I'll share my method, though I'm sure you can tweak it any way you like. 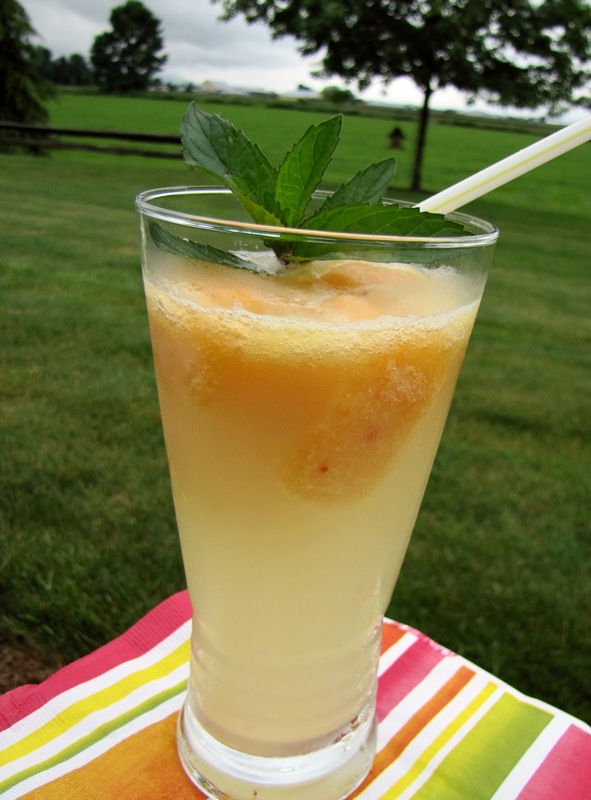 Peach ice cubes are a most refreshing addition to ice-tea, lemonade or (my favorite) Fresca. Pour into ice-cube trays and freeze until firm. Remove from trays and store in Ziploc bag. To me the path to inner peace is the knowledge that the Holy Spirit dwells in me and that I can have this peace that passes all understanding, no matter what happens in my life. Philippians 4: 6, 7 NIV "Do not be anxious about anything, but in every thing, by prayer and petition, with thanksgiving, present your requests to God. And the peace of God, which transcends all understanding, will guard your hearts and your minds in Christ Jesus." If we desire to have this inner peace, we will have to be willing to do the inner work. We need to accept 'what is' and not stress about things that we do not have control over. We need to let go of anger, regrets and disappointments that we experience in life.We can't have this inner peace if we are constantly judging ourselves and others, we need to be willing to admit when we are wrong, to forgive ourselves and others. If we think negatively of others we will most likely be thinking negatively of ourselves, let us strive to not let the negative rob us of the positive in our lives. 2 Timothy 1: 7 NIV " For God has not given us a spirit of fear and timidity, but of power, love, and self-discipline." To attain this inner peace it helps to memorize Bible verses about peace and to focus on God's power and perfect timing, that we can have inner peace no matter what turmoil is happening in our lives at any given time. John 14:27 NIV "Peace I leave with you; my peace I give you. I do not give to you as the world gives. Do not let your hearts be troubled and do not be afraid." Crab and shrimp add elegance and flavour to these savoury appetizers. Break stems off of mushrooms, saving 4 for the filling. Using a small spoon scrape the inside of the mushrooms clean. Wash thoroughly and dry on paper towel. Melt butter in a non stick skillet and saute onions and mushroom stems until onions turn opaque. While on low heat add cream cheese, cream, garlic, spices, bread crumbs. Stir well to combine and until cream cheese has melted. Add crab and shrimp. Stir well to combine. Squeeze lemon juice over mixture. Cook on low for 5 minutes. At this point you can allow to cool or fill mushrooms. Place cleaned mushrooms into a baking dish. Divide filling between mushrooms. Sprinkle tops with Parmesan cheese. Bake in 400º oven for 15 minutes. Serve immediately. Sloppy Joes don't usually have kidney beans in the recipe but we like them and they stretch the meat and the nutrition further. This will make enough to serve 25 adults. In a large stock pot, scramble fry the ground beef. I find using a stiff egg lifter and chopping it works well. Drain fat. Add the vegetables and continue to fry until the veggies are tender. Add the seasonings and sauces and bring to a simmer. Add the kidney beans and water. Simmer for an hour, stirring often. Add the instant mashed potatoes in the last 10 minutes of the simmer as needed to thicken the sauce. Serve with fresh sliced rolls and offer grated cheddar as an option to sprinkle over the sloppy joes..